Until about 300 years ago there was no continuous road from Aberdeen to Braemar. Prior to that the main routes needed for commerce crossed the Dee running north/south and there were probably only local routes linking nearby communities along the river. Development of a continuous route took place during the 18th and early 19th centuries. This was driven in part by the needs of the military and was encouraged by changes in legislation. Since its completion the exact route of the road has altered as it has been progressively developed to suit changing uses leaving older sections of road unused. 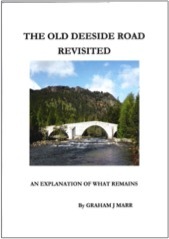 In this book Graham describes what can still be seen of the historical sections of the road. GM Fraser, whose 'The Old Deeside Road' was published in 1921. The present work aims to identify remaining sections of the old road and to examine how the remains have changed since Fraser's review. The route is described in some detail, especially where sections of the old road can still be clearly identified. In other places sections have been completely lost as a consequence of building of both the modern A93 and the railway from Aberdeen to Ballater. The description is accompanied by a series of maps which cover the entire route and which make it easy for readers to investigate the remaining sections of the road for themselves. It allows travellers on the A93 or Deeside Way to appreciate the historical context of these routes and to make interesting diversions from the direct routes. It will also be useful to anyone interested in the history of Deeside. A series of photographs are provided. Some illustrate the current condition of sections of the route whilst others replicate photographs included in Fraser's book, thus clearly illustrating changes that have occurred over the last 90 years. Graham will talk to North East Mountain Trust about exploring old roads on Deeside on 16th February 2016.